Young America’s Foundation (YAF), thanks to the generous support of Fred Allen, is excited to announce that YAF will be the exclusive home of New York Times bestselling author Ben Shapiro’s campus tour for the 2018-2019 school year. 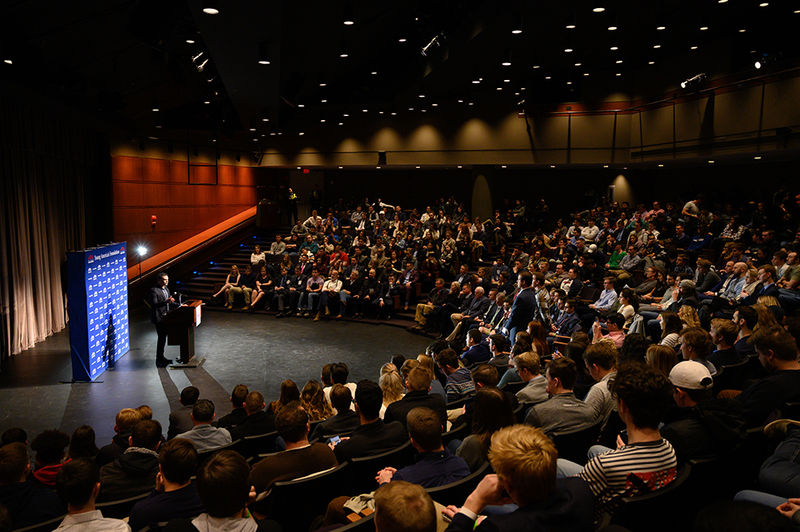 Now more than ever, conservative ideas are in demand on college campuses. And despite the Left’s best efforts, Shapiro continues to reach capacity campus audiences and millions more online. These powerful events are the result of combining Young America’s Foundation’s logistical expertise and financial support with Shapiro’s concise, compelling conservative message. It is a message young people are eager to hear. Because of Mr. Allen’s support, many students who have wanted to host Ben Shapiro, but lacked necessary campus funding, will have the ability to do so. Young America’s Foundation and our vast student network will continue to plan Shapiro’s campus events using our time-tested process to ensure each lecture is a success. This fall, Ben Shapiro will speak on three campuses bringing his “Facts Don’t Care About Your Feelings” message directly to students and community members. CLICK HERE TO LEARN MORE AND APPLY TO HOST BEN SHAPIRO! Young America’s Foundation is here to make activism easy, whether you are the leader of a Young Americans for Freedom chapter or of another student organization on campus. We will walk you through the entire process of hosting Ben Shapiro (or one of our other 70+ speakers) on your campus, and we will provide your organization with both logistical and financial support to ensure your event is a success. Given the limited number of engagements that Ben can accept for the fall, the following requirements MUST be met in order for your school to be considered for an event. 1. Young America’s Foundation can cover a substantial portion of Ben’s fee. However, we do require that we be the sole national sponsor of Ben’s campus events. 2. Venue must be able to accommodate between 2,000-2,500 students and community members. 4. The venue must be accessible to Young America’s Foundation staff and streaming crew all day during the event. 6. All announcements regarding tickets (if needed) and promotional items must be approved by Young America’s Foundation in advance. 2: Solicit your school for funding. Please submit this initial inquiry form for information on Ben Shapiro’s honorarium. Then file a request for funding with your school’s student government and or student activity committee. Please note that in order to be considered for a fall date, you must submitting your proposal as a Word doc or PDF with the information as outlined in step 3 below. Many schools are happy to underwrite a parade of liberal speakers on campus, so some funding should rightly go towards conservative speakers. You should request the full amount in your school application. However, we are aware that most funding boards will not provide the full amount. Therefore, Young America’s Foundation will work to provide the balance of the funding you may not receive from your school. We realize some schools require a tentative date from a speaker in order to receive funding. However, given the high amount of requests Shapiro receives, giving a tentative date of availability will not be possible. Once your funding has been allocated, we ask that you submit a proposal to Young America’s Foundation as a Word document or PDF. Please keep in mind that you will be competing with other schools to host Ben Shapiro on campus. For the 2018-2019 school year, we received more than 1,500 inquiries for Ben to speak on just twelve campuses, so be sure to make your proposal compelling and underscore your club’s ability to ensure the event will be a success. d. Expected attendance and suggested venue for the event. Images and/or a venue floor plan are helpful to include. g. A tentative schedule for the event including the suggested time of the lecture, club dinner, book signing or reception. All applications must be emailed to Patrick Coyle by close of business on Wednesday, May 15, 2019. ClICK HERE TO VIEW ALL OF BEN'S 2019 TOUR STOPS! Following more than 1,500 requests from students on campuses across the country, Young America’s Foundation is excited to announce the six schools set to host Ben Shapiro through Young America’s Foundation’s exclusive Fred Allen Lecture Series during the upcoming school semester. Click here for ticket information.